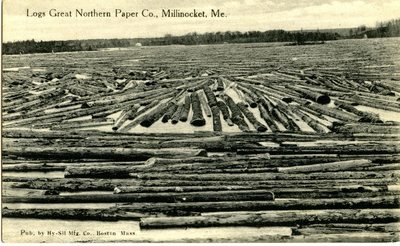 "Millinocket, Maine, Great Northern Paper Company Logs "
A postcard of an image of logs of the Great Northern Paper Co. floating down the West Branch of the Penobscot River from Millinocket, Maine. Text in the lower left appears to say, "Pub. by Hy-Sil Mfg. Co, Boston Mass." No date.